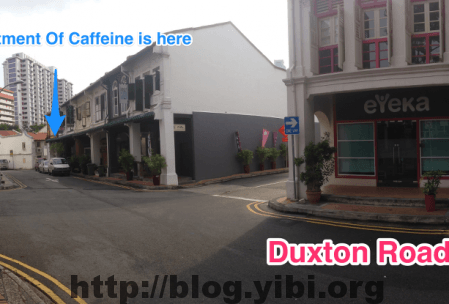 I have been working in Duxton for the past 2 years. And over the 2 years, numerous cafe / wine bar / restaurants have sprouted. The more popular ones, especially among the youngsters are Department of Caffeine and Group Therapy. These 2 are cafes that serve good coffee. So now there’s this interesting thing. People getting lost when trying to find these 2 places. I would sometimes stand outside the office to get breather. And while I’m doing so, I see people walking up and down Duxton Hill, to and fro Duxton Road. Some of them even went beyond to Neil Road. They are obviously lost. I decided to be helpful, so I would ask where they wanted to go. Most of them are searching for the 2 cafe I mentioned. So to take this “helpfulness” further, I took a panorama picture and labelled the joints. Group Therapy – They are along Duxton Road. Again, it’s easy to miss them. They are like about halfway through the row of shophouses and on the 2nd floor, so walk slowly. Look out for this restaurant called Etna. Group Therapy is above them on the 2nd floor. Next Do These Look Like New Book From Amazon?